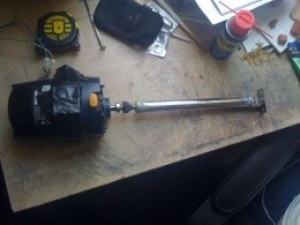 Homemade linear actuator for moving a rod in and out of a sleeve. Constructed with epoxy, threaded rod, nuts, a piece of clothes rail, clothes rail holder, and a reversible DC motor. This may come in handy someday. Filed under actuators.